“Sometimes you’re the windshield, sometimes you’re the bug.” Today we were the bug on Cayambe! Before I get to the crash, let’s catch up a bit from the last full post. 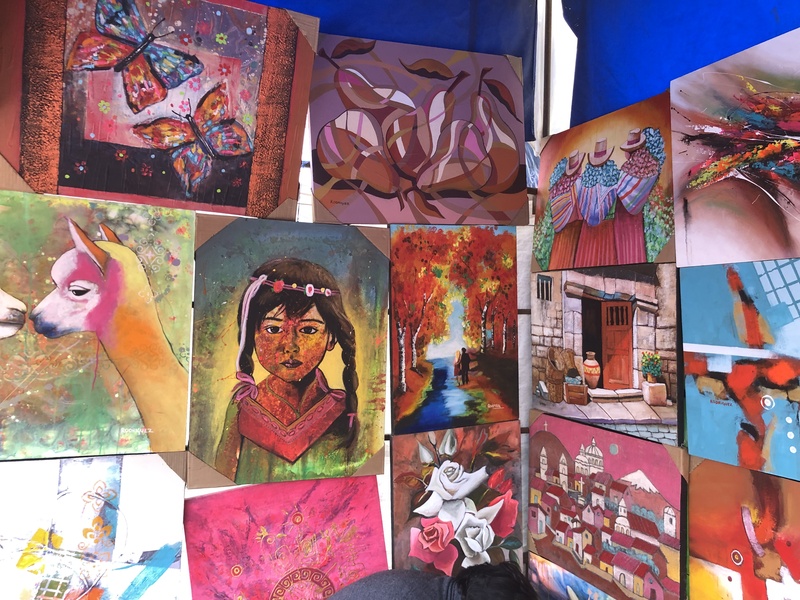 I’ll keep repeating that I find Ecuador delightful. The cities, the countryside, the people, the mountains/volcanoes (what I can see of them!) It’s a similar feeling I had on my first visit to Nepal and now I’ve returned 13 times. Perhaps the same is in store for this South American treasure. 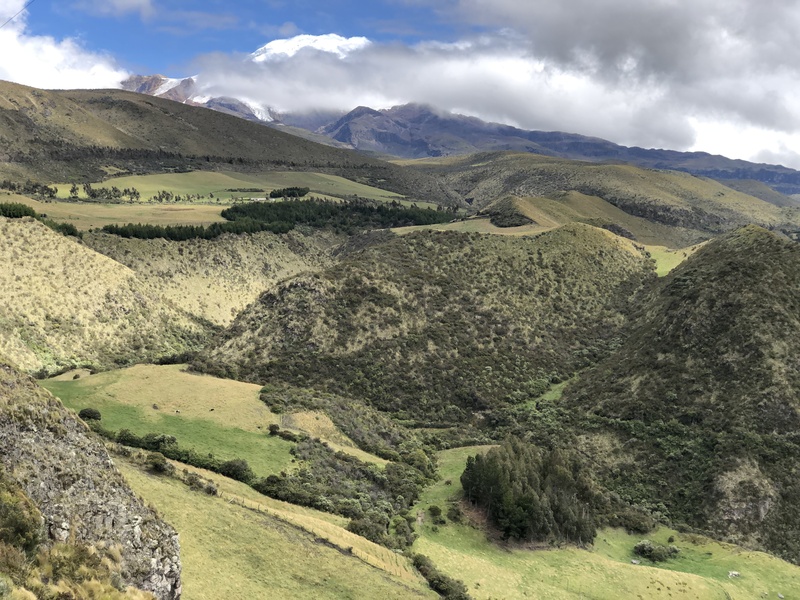 As I covered when I first announced my plans to climb the three Ecuadoran volcanoes: Cayambe, Cotopaxi and Chimborazo with my good friend Robert LeClair and guided by Mountain Madness, I really had no idea what was I was in for. 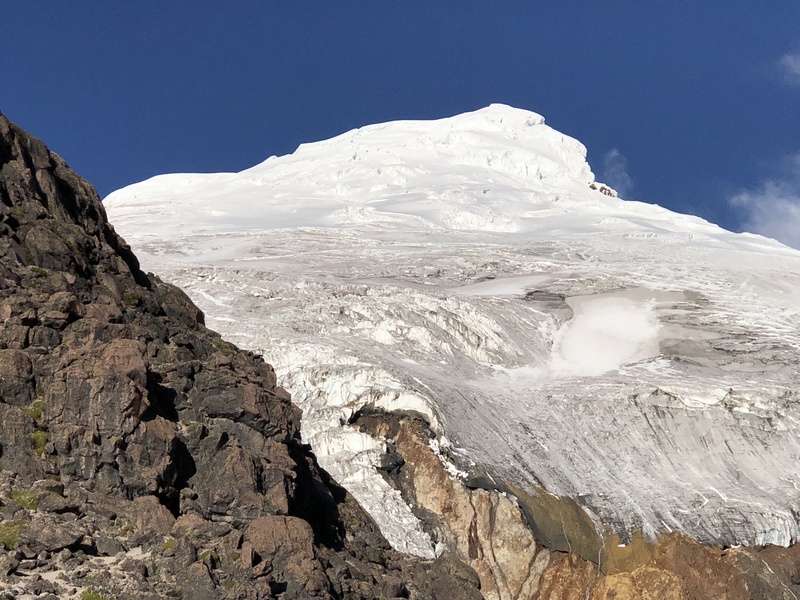 Of course, I researched the climbs and knew they could be dicey, or more accurately icy, and also the weather was always a variable given they are situated next to the huge Ecuador Amazon Rainforest which launches moisture-laden clouds over all the volcanoes, especially Cayambe. But I yearned to return to 20,000-feet and climb something new. 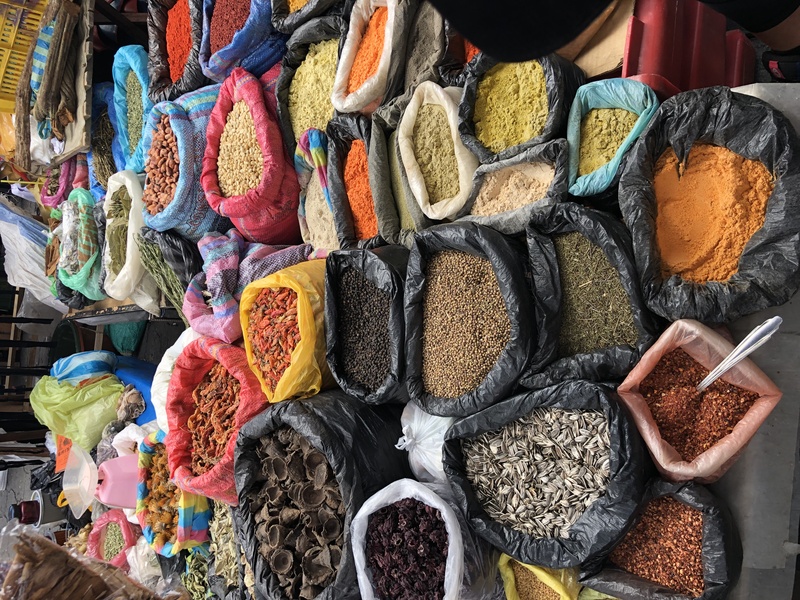 Since I arrived here about a week ago, we have spent most of our time “acclimatizing.” I quote this because some of it involved shopping and taking city tours, not exactly the standard program. 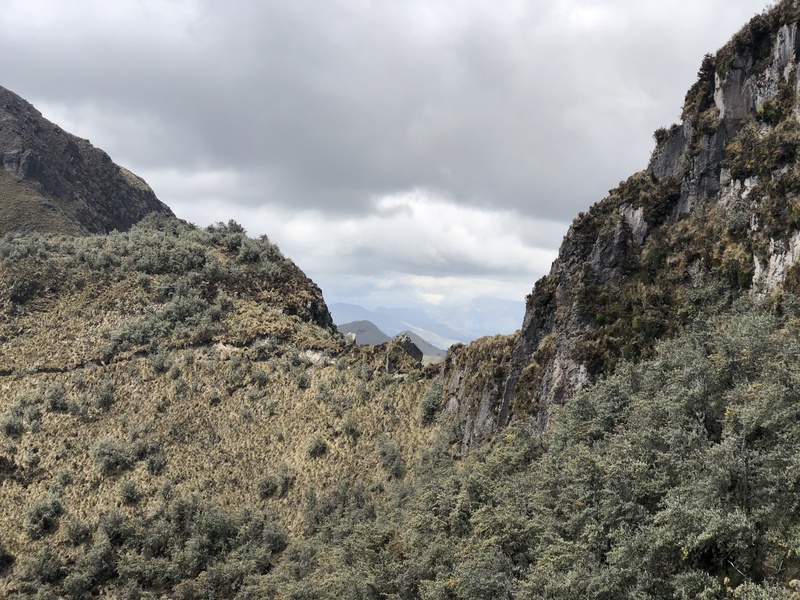 However remember that Quito, which serves as our base is at 2,850-meters/9,350-feet. Also, we took several hikes as high as 15,500-feet. 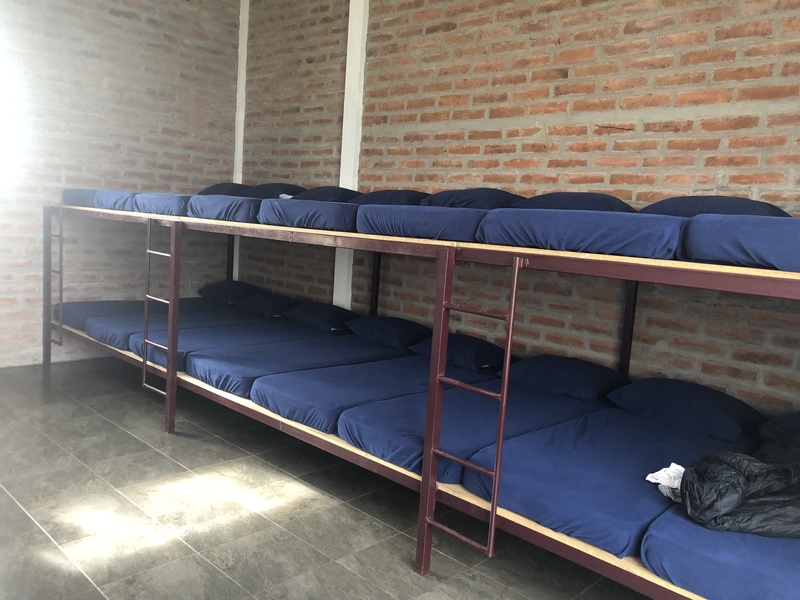 So if you are looking for hard-core, stinky, no-shower, freeze-dried food, isolated with the people you came with, well this may not be your thing! 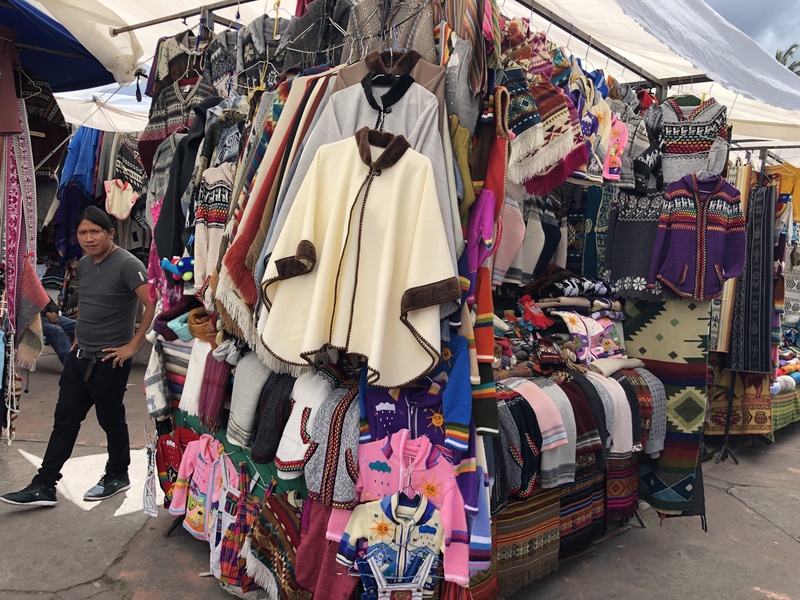 In addition to our day hikes, we also visited the colorful market in Otavalo. Another fun surprise with all the beautiful textiles, rugs, clothing, sculptures and art. Bargaining was fun but not cutthroat like other parts of the world. 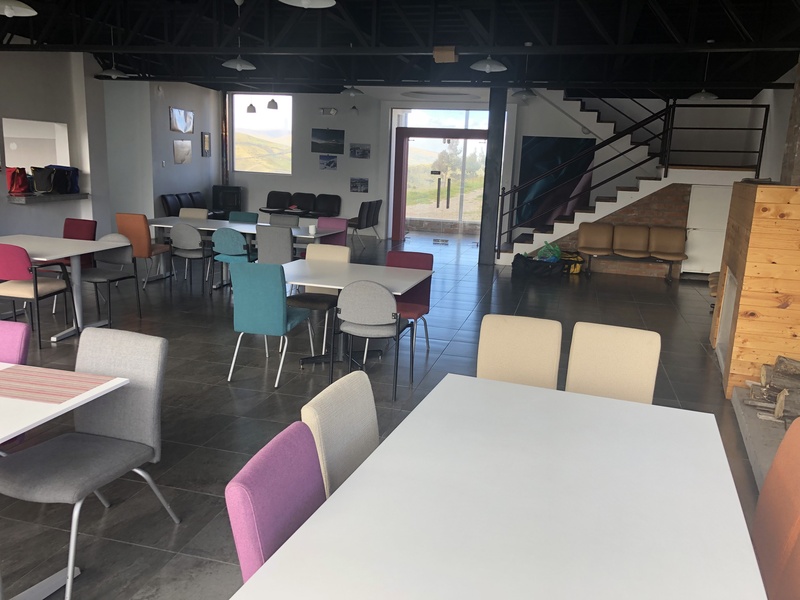 Again, having lunch or dinner in a local restaurant was a treat. 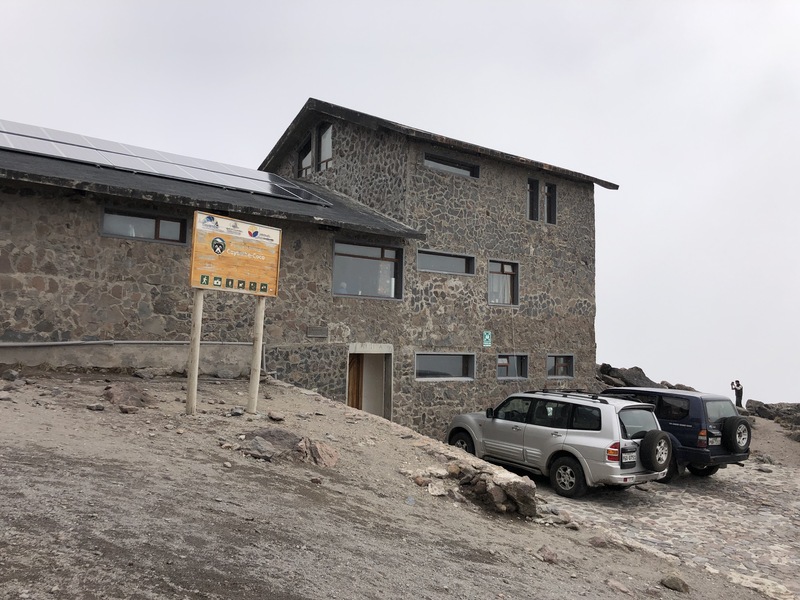 So before you think this is a glorified shopping trip, which I won’t deny, We made our way to the hut on Cayambe at 15,500-feet to get ready to attempt Cayambe last night. 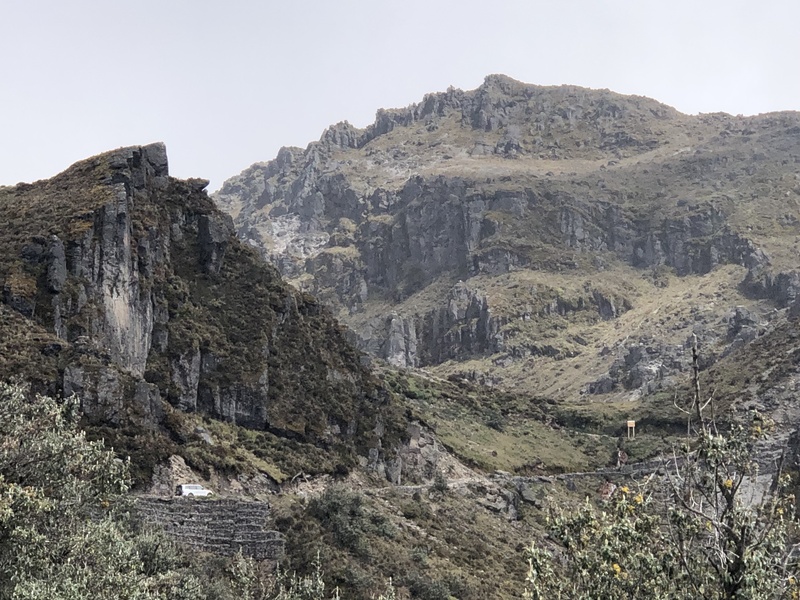 Our team of nine, six members and three Ecuadorean guides, were all acclimatized and well prepared for whatever might come our way. The Mountain Madness team here is top shelf. Perfect English, impeccable organizational skills and polite to a tee. 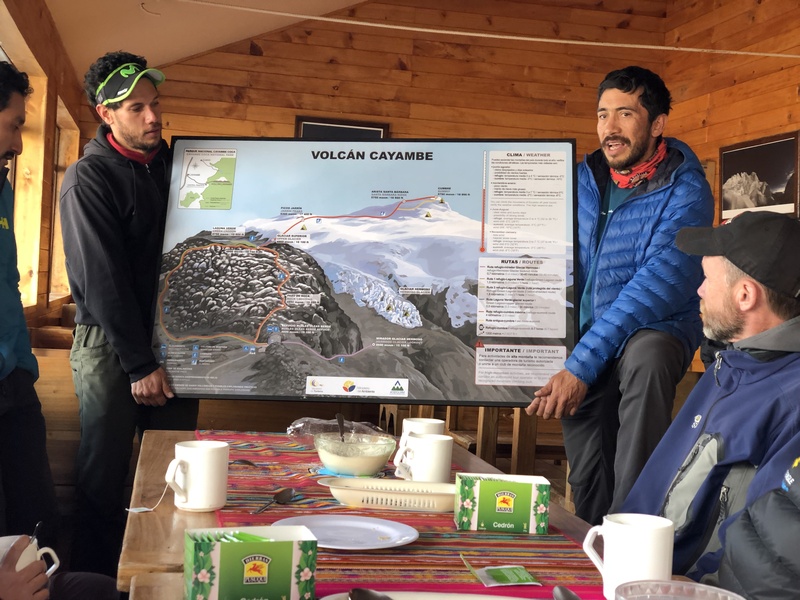 It’s been a nice case study to see expert mountain guiding as it continues to develop around the globe. 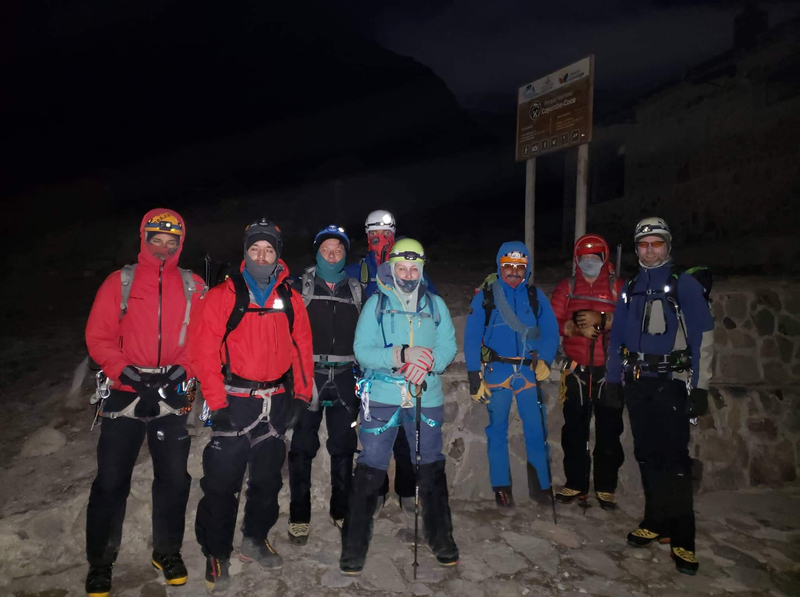 Lead by Oswaldo Freire aka Ossy, his fellow guides Joshua Jarrin are both UIAGM/IFMGA certified and show their skills constantly putting safety first along with the third guide, Ecuadoran Camilo Jose Andrade Davila. 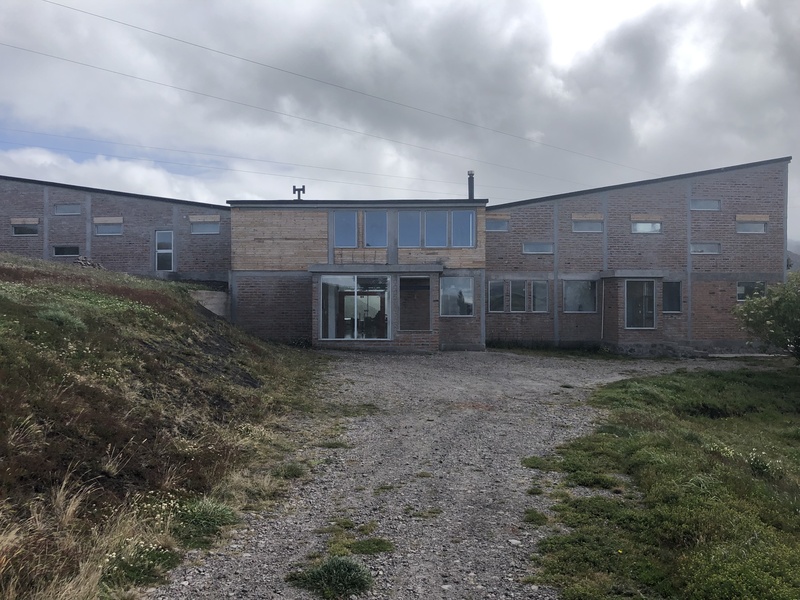 On Monday 21, January 2019, we went to the Cayambe hut hoping to do a short 1,000-foot climb to the glacier but strong winds and constant rain stopped those plans so we relaxed in the hut for three hours “acclimatizing.” 🙂 We returned for the night to a newly built hut/climbing school complex built by the Mountaineering Club of the Jesuit school San Gabriel. 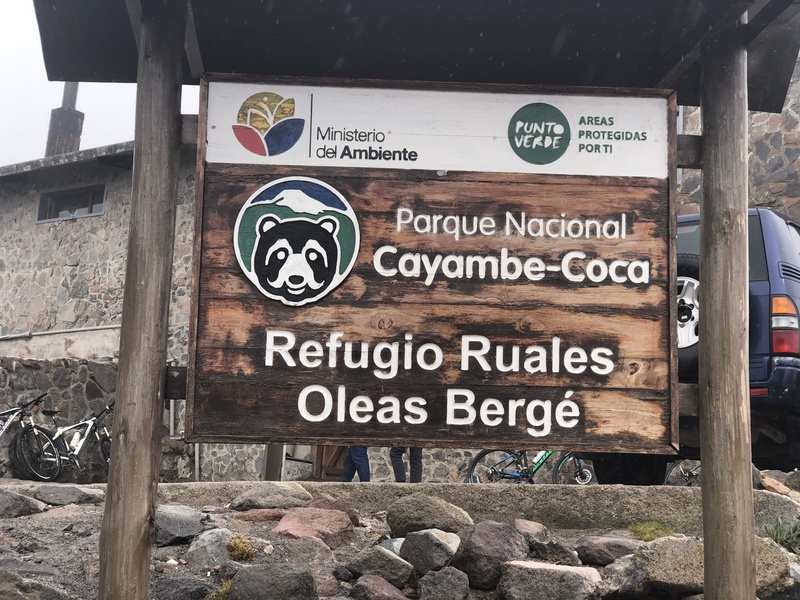 It’s about half an hour away from the Cayambe Hut and was much for comfortable and had excellent food. So with all the prelims out of the way it was time to climb our first volcano. We returned to the high hut aiming to go to bed at 6 for an 11 pm wake-up. 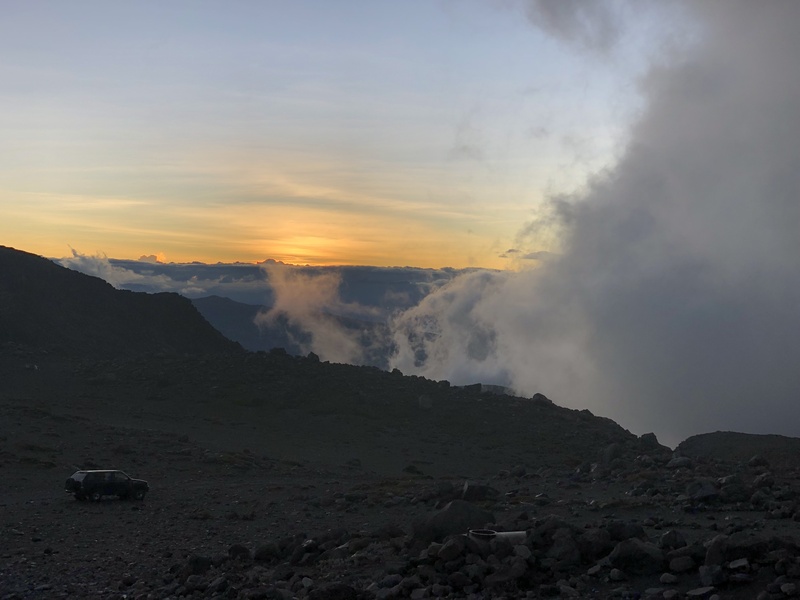 Clouds covered the peak damping our spirits but just before bed, the skies cleared and I can confirm I saw at least one volcano, and it was stunning! Pumped, we went to sleep. Everyone was prompt and excited sincerely assuming we would summit given the absence of clouds a few hours earlier. However, during the evening, the winds picked up disturbing what little sleep we were hoping to get. Getting dressed was like a fire station with ongoing alarms: layers, harness, coffee, bathroom, sunscreen (joke) (not), crampons (not on, quite yet) … anyway, you get the idea. Nine people focused on being on time and out the door at midnight. We made it at 12:15. Out for a group picture taken by the Boss, Ossy, and off to the summit. Again we made good time and were on schedule for a six-hourish summit push when everything fell apart, quite literally. I felt moisture on my face but didn’t see any rain or snow falling. I pointed my headlamp towards my down jacket sleeve and was surprised to see it saturated. Soaking wet. And down and water do not go together as down loses its warmth when wet. We stopped to add layers, including Gortex jackets to ward off the moisture. About this time low clouds overtook the upper part of the mountain. I was on the middle team with the others 5 – 20 minutes ahead and behind. 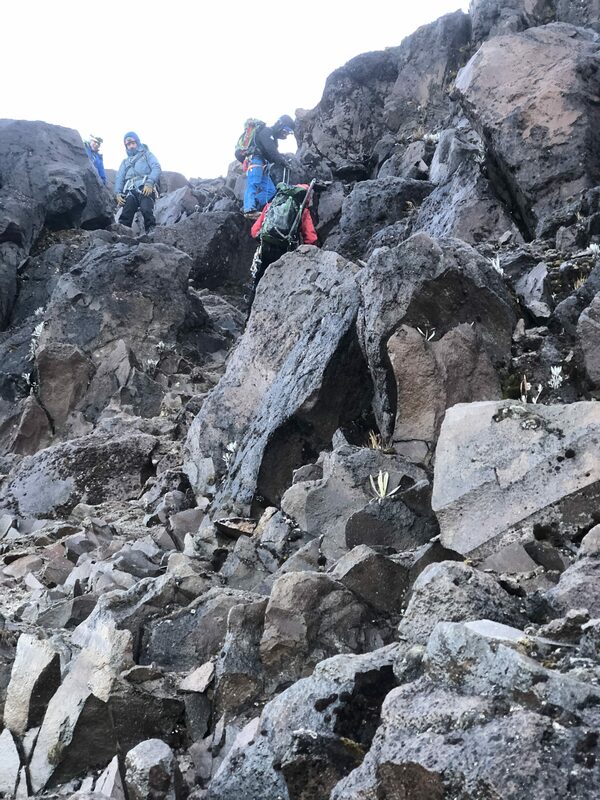 Impressively, the three guides who are like brothers on the mountain, all reached the same conclusion at almost the exact same and brought their teams to a halt. 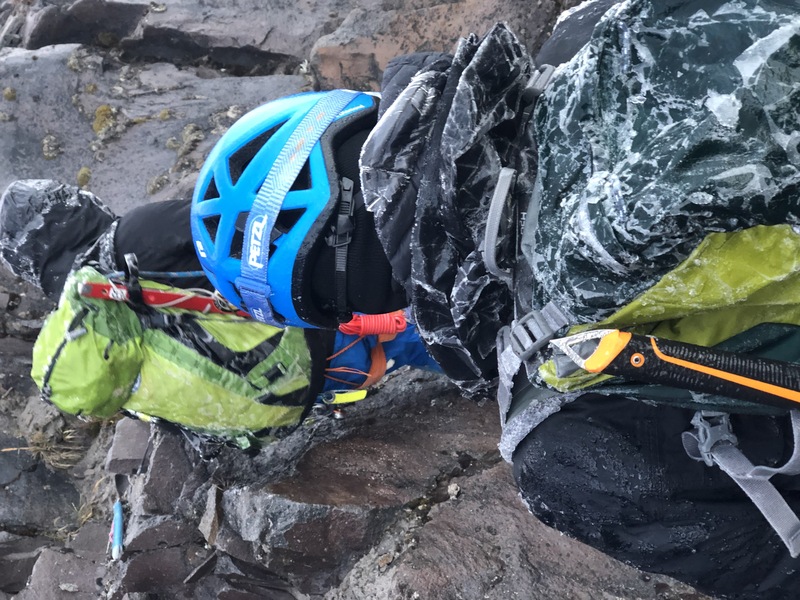 Joshua turned back to us and said: “It looks bad and it’s still 3 hours to the summit plus more to get back in these conditions.” I nodded and added, “I think it’s silly to continue and am happy to turn back.” Not needing my vote, he went on to talk about the safety gear to do a crevasse rescue could be compromised by the wet ice rain. Enough said. 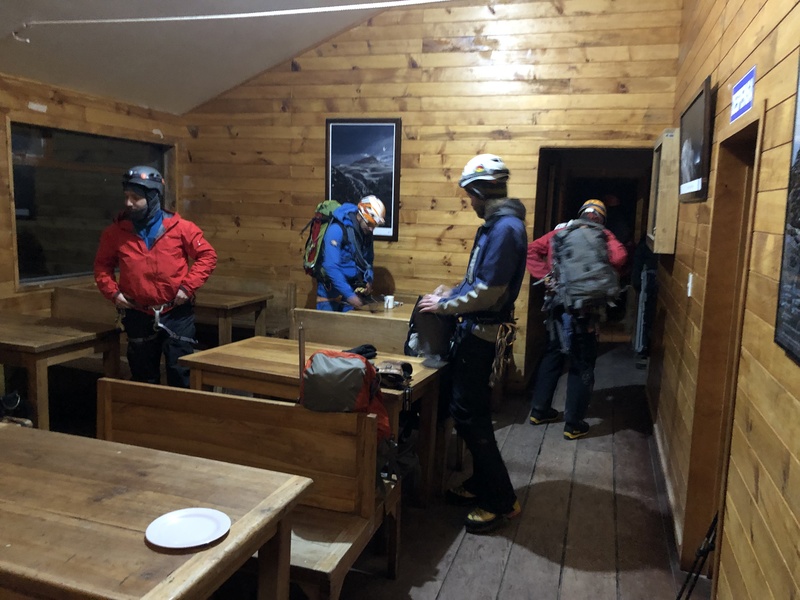 Before we left the hut hours earlier, Ossy and crew had made it clear that safety was first, and everyone was in total agreement. 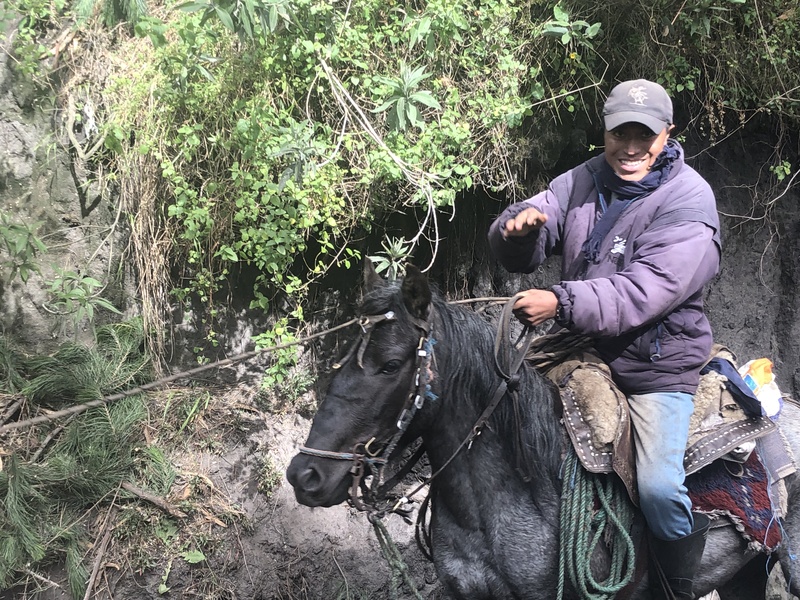 Soon Cam arrived and then we caught up with Ossy and collectively we made our way down from the high slopes of Cayambe. 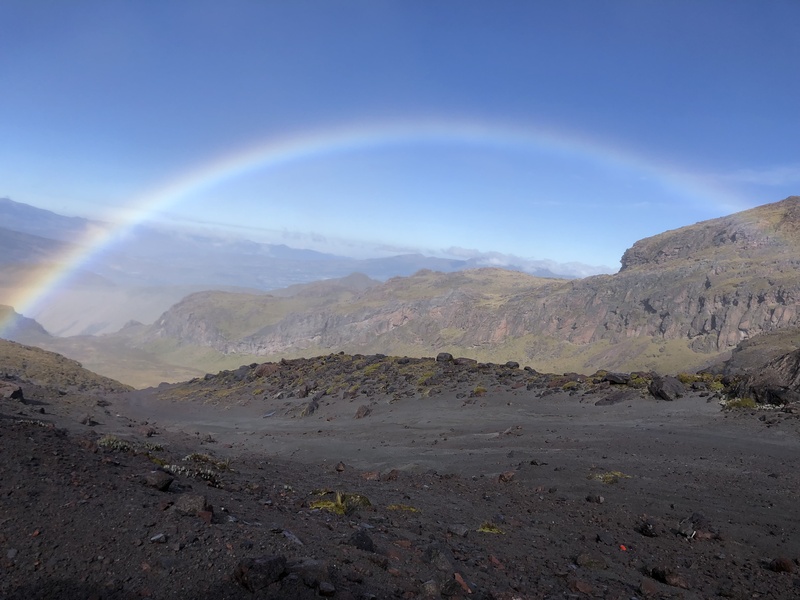 Our high was 17,100-feet on this 18,900-foot volcano, and everyone was happy. While some may think we should have toughed it out, I felt good about the decision. This was a dangerous situation, degrading fast. No summit is worth the risk that was developing right on top of us. I’ve seen teams on Everest push situations like this to summit and return covered with hoarfrost lucky to have lived. Well done by the Mountain Madness guides and team to work so well together. 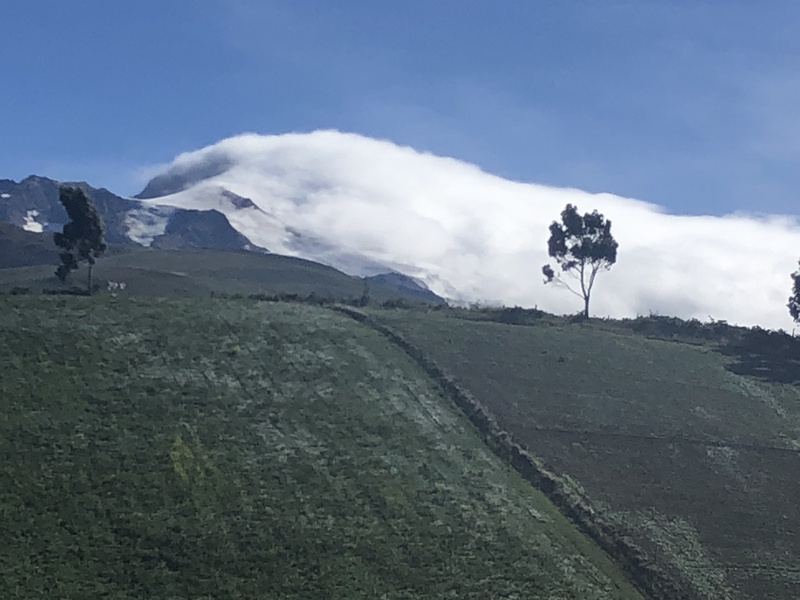 As we reached the town of Cayambe, clouds were parked on the summit. We made the right call. By the way, my leg from the Twin Sisters incident performed fine as did my lungs which acted up last October in Nepal.